Story: Keegan-Michael Key and Jordan Peele star as Clarence and Rell, two cousins who live in the city but are far from streetwise. 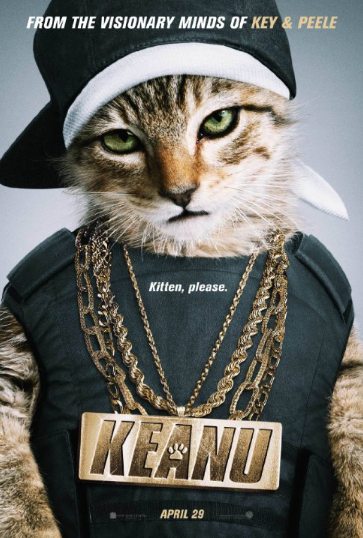 When Rell’s beloved kitten, Keanu, is catnapped, the hopelessly straight-laced pair must impersonate ruthless killers in order to infiltrate a street gang and retrieve the purloined feline. But the incredibly adorable kitten becomes so coveted that the fight over his custody creates a gang war, forcing our two unwitting heroes to take the law into their own hands. Source: JoBlo. This entry was posted in Upcoming Films and tagged Comedy, Jordan Peele, Keegan-Michael Key, Nia Long by blackcinemaconnection. Bookmark the permalink.